Your premier manufacturer of Gin Poles built in USA. Our gin poles are built utilizing 100 % recycled US steel, and you will not find a more reliable pole manufactured with the quality and backing which Landa Mobile Systems, LLC provides. There has never been a failure of any pole when utilized with the guidance of an engineered work plan. Safety is our priority and we are committed to building the safest gin poles in the northern hemisphere. WARNING: Our Triangular Gin Pole the gross load. Man Rated “when lifting personnel shall not exceed 50% of the charted safe lifted loads. No other construction loads shall be lifted with personnel”. We are not participating in AISC. WARNING: Our Triangular Gin Poles gross load. Man Rated.. “when lifting personnel shall not exceed 50% of the charted safe lifted loads. No other construction loads shall be lifted with personnel”. We are not participating in AISC. Certified AWS independent plant U.S. contractor inspected AWS D1.1:2015 Structural welding code-steel compliance, no AISC association. The zinc coating can be sealed with a thin coating of low viscosity polyurethane, epoxy-phenolic, epoxy, or vinyl resin. The details of the application sequence and procedures can be found in ANSI/AWS C2.18-93. We maintain records of all poles and have history as well and original manufacturing documentation in case of loss. As pole manufacture Landa we only address the gin pole mast and allowable load and tag capacities / angles based solely upon the mast’s rated strength. Affirming the pole was designed, built and load charts are in accordance with the ANSI/TIA-322 standard. Its operator responsibility to ensure they are in compliance with all regulations related thereto. Complete records of pole inspections and record of Magnetic particle inspection shall be performed on 10% of the welded connections every 10 years. Annual inspections reports shall be maintained for a minimum of two years. Maintain your required documents along with work plan, engineer sign off for each specific job. ANSI/TIA-322 standard includes an impact factor of 1.7 for all gin poles using synthetic load lines. Gin Pole storage racks for gin poles are recommended for safe transport, storage and return shipping for inspection service. These units protect and reduce the potential of damage from excess handling with forks etc. WE WILL NOT PUT PEOPLES’ LIVES AT RISK. Know the Regulations, and order the new ANSI/TIA-322 and OSHA CPL 2-1.36. Rigging plans for all gin pole use must be prepared in accordance with the ANSI/ASSE A10.48. Our standard load charts are relevant where wind speed does not exceed 30 mph gust at any given elevation during proposed lift. “Load carts are not interchangeable” and do not match older models. Load Charts supplied are pole specific with serial numbers matching pole and expire with annual inspection certification. AISC: Certification Program for Structural Steel Fabricator-Standard for Steel Building Structures-2006, AISC 201:2006, American Institute of Steel Construction, 2006. Guide for the Analysis of Guy and Stiff leg Derricks, American Institute of Steel Construction, 1974. Steel Construction Manual, 14th Edition, American Institute of Steel Construction, 2010. Design Loads on Structures During Construction, SEI/ASCE 37-02, American Society of Civil Engineers, 2002. 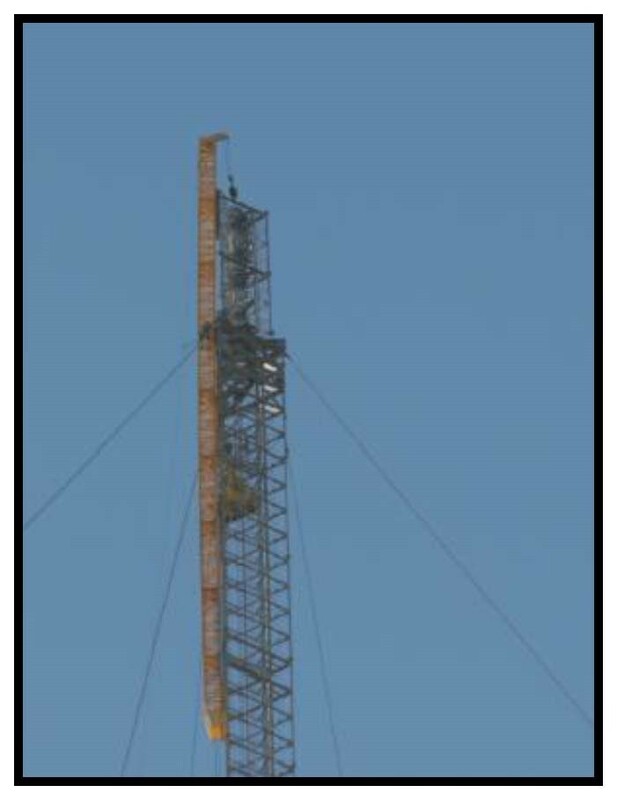 Criteria for Safety Practices with the Construction, Demolition, Modification, and Maintenance of Communication Structures, ANSI/ASSE A10.48-2016, American Society of Safety Engineers, 2016. Standard Specification for General Requirements for Rolled Structural Steel Bars, Plates, Shapes, and Sheet Piling, ASTM A6/A6M-14, ASTM International, 2014. Standard Specification for Steel, Sheet, Carbon, Structural, and High-Strength, Low-Alloy, Hot-Rolled and Cold-Rolled, General Requirements for, ASTM A568/A568M-15, ASTM International, 2015. Standard Test Methods and Definitions for Mechanical Testing of Steel Products, ASTM A370-15, ASTM International, 2015. Structural Welding Code – Steel, AWS D1.1/D1.1M:2015, American Welding Society, 2015. Structural Standard for Antenna Supporting Structures and Antennas, ANSI/TIA- 222-G, Telecommunications Industry Association, 2005. Facility AWS D1.1:2015 Structural Welding Code-Steel. per section 6.9 of the code Certified, and 100% US Certified Welders welding to AWS, Certified 100% (AWS) D1.1 independent contractor inspected before leaving our facility. Not participating in AISC certification. Towers are 100% hot dipped galvanized finished to EN ISO 1461/ASTM A123/CSA G164 and ANSI/EIA-TIA-222 G, per section 107 and CSA S37 standards. Steel is ASTM A500, grade B/C. All products manufactured are Engineered and warranted. We have become the finest manufacturer of Gin Poles, Portable Towers, Climber Training Towers, Oil and Gas Flare Towers and Portable Shelters in the Americas, thanks to team efforts and most important our customer support. “Service disabled veteran owned company built in America by Americans.” Minority owner and plant located in “HUB zone certified”. Support our efforts as we support your freedom.